We are a professional company based in London, which can offer you the best oven cleaning services. Using only toxic-free products and special cleaning techniques, our employees will eliminate all microbes, dust, parts of food and grime from the surface of your oven, so that you can use it without any worries. Instead of looking all the time for the best cleaning products you can purchase, you can save some money by simply dialling the number of our reputable agency. We will provide the necessary supplies and our experienced employees will make sure that they are used properly for the thorough disinfection of your oven. 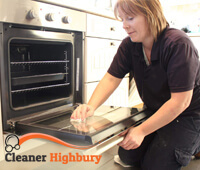 Come and book the best oven cleaning service right in Highbury. The regular usage of the kitchen appliances inevitably leaves its mark on them. In order to be sure that you and your family are safe, you can book one of our affordable and very effective oven cleaning procedures. For the performance of the procedure we will send you our most skilful specialists who will inspect carefully all parts of your kitchen appliance and then they will disinfect the whole oven with special chemical-free products. We can guarantee that you won’t be able to recognise your oven once our specialists finish with their work. 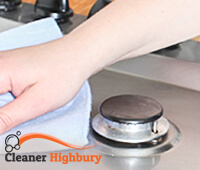 All greasy spots, parts of food and dust will be gone and the surface of the appliance will be sparkling clean. We can guarantee the cleanness of one of the most important kitchen appliances that you use on a daily basis, so all that you have to do now is to dial our phone number or come and reserve your oven cleaning service directly in our official headquarters in Highbury.